SKINNY TRICK: ONE INGREDIENT "ICE CREAM"
You make ice cream...without 99% of the fat, sugar, dairy and hour long wait. 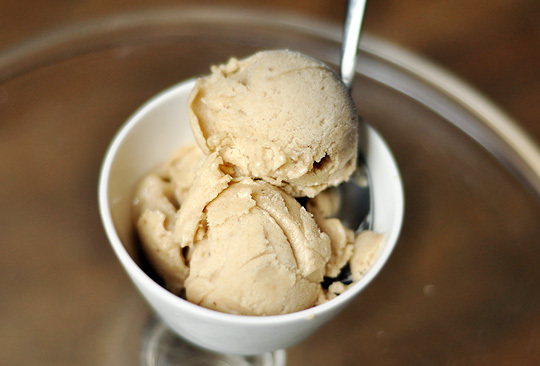 Yep, this one ingredient ice cream (thanks to the ladies over at TheKitchn.com) exceeded my expectations. Now I really have no excuse not to fit into those skinny jeans come spring time. The main ingredient in this wonder dessert? Bananas. I was beyond stoked to find a use for all those bananas that were quickly going south, but couldn't bring myself to make another banana bread. There has been way to much of that lately in this household. 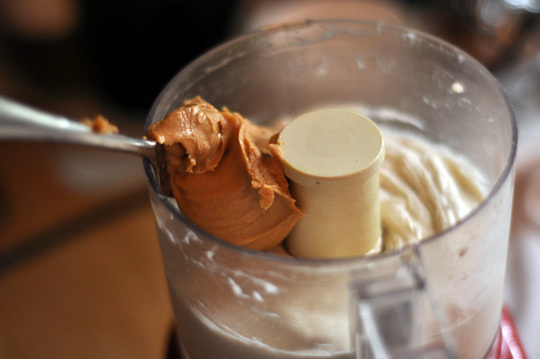 I added a bit of peanut butter into the mixture at the end just to spice things up a bit...the original post even suggested using honey which I bet would taste amazing. You could even go nuts (literally) by adding toasted pecans, cocoa, maple syrup...whatever your heart desires! 1. 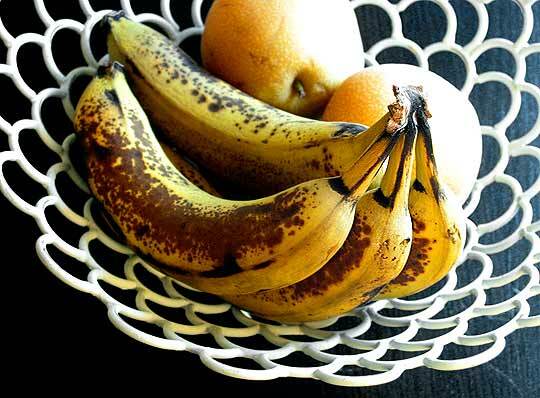 Peel bananas and cut them into small pieces. 2. Freeze them on a plate for 1-2 hours minimum. Editor's note: I tossed all mine into a tupperware, and froze overnight. When I took it out of the freezer, the bananas were a huge frozen blob. I ran them under really hot water for a few seconds then drained the water from the tupperware, and pried the bananas apart in chunks. They actually came apart pretty easily. 3. 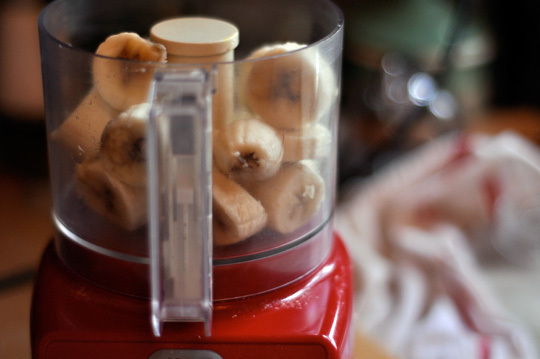 Transfer the frozen bananas into a food processor that can accommodate the amount of bananas you will be using to make this recipe. Once the processor is locked and loaded, blend away! 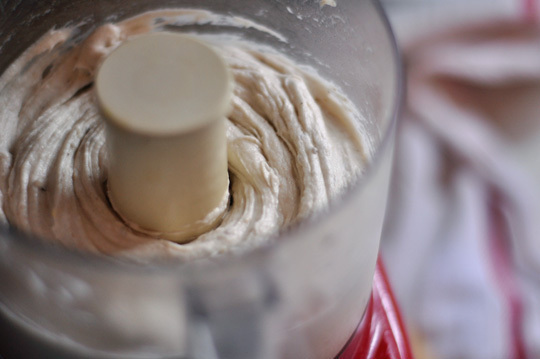 The consistency will look pretty chunky monkey in the beginning - just stop the machine, stir the mixture to get it evenly blended, and start it up again. It took about 5 or 6 stirs until it was a smooth consistency. 4. Once you get it to the consistency that you want, you can add in the extras if desired. 5. Serve immediately for a soft-serve ice cream dessert, or put in the freezer so it can harden up. And just like that, a magical dessert that is totally guilt-free. ENJOY!!! 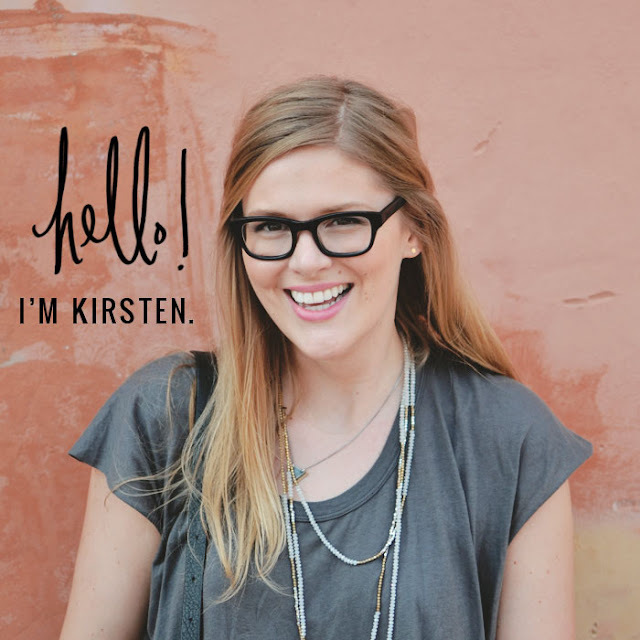 EDITOR'S NOTE #2: I read a comment on The Kitchn post that said you can try this same concept with frozen avocados! My curiosity is peaked...I mean, you are talking to the girl that ordered an avocado smoothie on her honeymoon. SO....calling all my California girls with access to legit avocados (and not the crappy ones here on the East Coast), let me know if you try this and how it turns out!!! This sounds fantastic, and now that Weight Watchers has all fruits at 0 points, I will HAVE to try this out! Thank you! yum yum and healthy to boot! Just in time for the Holidays. ok this is brilliant! and sounds so good! No kidding, gals....this stuff is AMAZING! It has the consistency of banana flavored gelato. Literally my new fave dessert. Would love to hear how you think it tastes when you make it. I could eat a pint of it in one sitting, lol. That ice cream looks amazing. I cannot believe it is made only of bananas.